*Equine-specific molecular weight formula. Not intended for use in other species. For more information please contact Integricare. 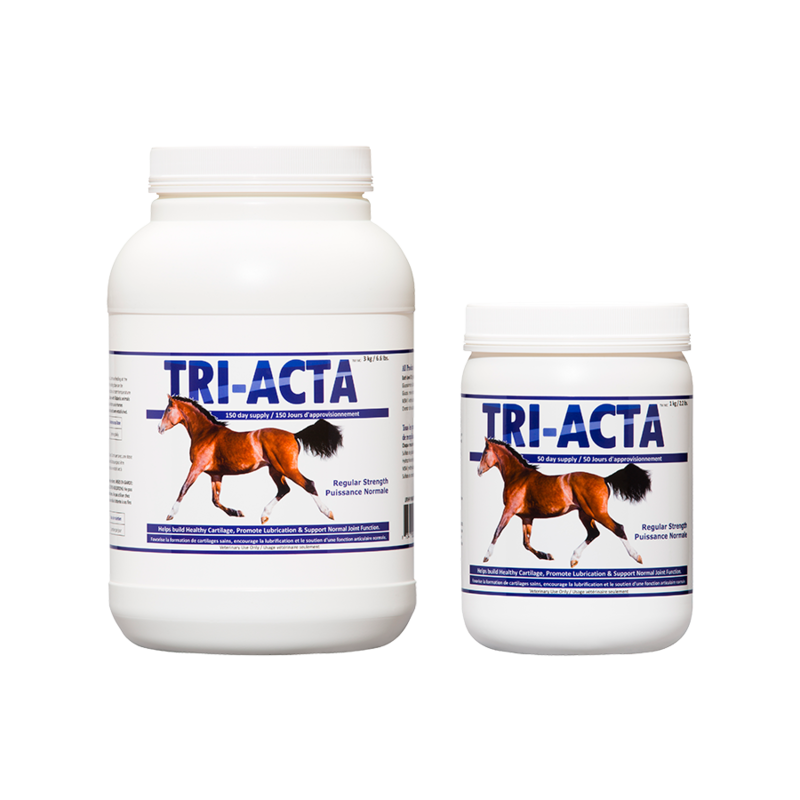 TRI-ACTA Regular Strength provides preventative support for younger horses, helps mitigate the early onset of joint degeneration and other mobility issues. Young sport horses can benefit from the support of TRI-ACTA to maintain healthy joint function and fluidity of movement. It is also ideal as a cost-effective, long-term solution to promote joint function and fluidity of movement in retired or pleasure horses. TRI-ACTA is composed of 100% active, pharmaceutical-grade ingredients without any fillers or synthetic additives. Each component has been extensively researched and clinically trialled for their bio-availability and effectiveness to support proper joint function and mobility in horses. Because the product is pure and concentrated, the servings are small and easy to administer. Our 20g daily serving of TRI-ACTA provides your horse with the therapeutic dose of key, all-active ingredients needed to prevent and mitigate the onset of joint degeneration. Why is TRI-ACTA so effective? 100% Active Ingredients – No Filler! Integricare only includes pure, pharmaceutical grade ingredients at the highest quality in our supplements. We source all our ingredients within Canada and stand behind our TRI-ACTA supplements being a 100% Canadian product. The ingredients specifically selected for TRI-ACTA products have been consistently proven through numerous scientific studies to work effectively together to support optimal joint health and mobility. Degeneration of the joint matrix and supporting tissues occurs naturally during the ageing process as the horse loses its ability to produce glucosamine, chondroitin, MSM, and hyaluronic acid. 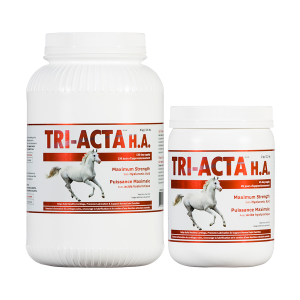 Having lost the ability to produce sufficient levels of these naturally occurring components, horses require supplementation to compensate in order to maintain healthy joint function ⎯ that’s where TRI-ACTA comes in. TRI-ACTA delivers a daily therapeutic dose of these key components required for healthy joint function that your horse may be lacking as they age and experience physical wear and tear. Furthermore, TRI-ACTA’s ingredients are of the specific molecular weight that most closely resembles what the equine body produces naturally, making TRI-ACTA extremely bioavailable, therapeutic, and effective. With no filler, allergens, synthetic additives, or preservatives, TRI-ACTA products present no risk of adverse side effects or contraindications with medications. TRI-ACTA provides your horse with the most effective and scientifically-proven blend of key ingredients necessary for supporting optimal joint function and mobility in a highly bioavailable form. ALL ACTIVE INGREDIENT – NO FILLER! Using the measuring scoop provided, mix TRI-ACTA with the horse’s feed. For optimal results double the recommended daily maintenance level for 10 days. When desired improvement is noticeable, decrease dosage to the recommended maintenance level. The time to achieve a positive response will vary depending on the severity of each condition. The initial dose may be continued until the desired response is achieved, and then reduced to the ongoing maintenance dose. If you have any questions or concerns regarding the use of TRI-ACTA, contact Integricare.